FILE - Chinese People’s Liberation Army personnel attend the opening ceremony of China’s military base in Djibouti, Aug. 1, 2017. 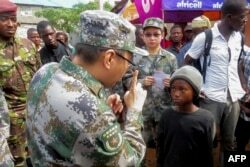 Editor’s note: This is one in a series of articles looking at Chinese involvement in Africa. Also read about infrastructure deals and business opportunities. Paul Nantulya, a research associate at the Africa Center for Strategic Studies who focuses on China-Africa relations and security, told VOA that China’s military involvement in Africa blends ideology, economics and politics. FILE - A medical team from the Chinese People’s Liberation Army meets with locals in Sierra Leone as they arrive close to the site of a mudslide on Sugar Loaf Mountain, in Freetown, Aug. 17, 2017. 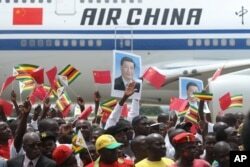 FILE - Zimbabweans wave flags while welcoming Chinese President Xi Jinping in Harare, Zimbabwe, Dec. 1, 2015. 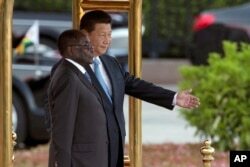 Xi visited Zimbabwe for a two-day State visit aimed at strengthening relationships between the two countries. Whereas Western countries focus on heavy hardware — jets, tanks, rockets — China’s niche has long been small arms, including pistols and AK-47 assault rifles, Nantulya said. 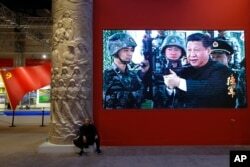 FILE - A man rests next a video screen showing Chinese President Xi Jinping holding a rifle at an exhibition highlighting China’s achievements under five years of his leadership at the Beijing Exhibition Hall in the capital city, Oct. 23, 2017. FILE - Chinese President Xi Jinping, right, shows Zimbabwe’s former President Robert Mugabe the way during a welcome ceremony outside the Great Hall of the People in Beijing, China, Aug. 25, 2014. The BRI projects, including railways, dams, ports and a sprawling new free-trade zone in Djibouti, have the potential to accelerate Africa’s industrialization. In many cases, they also entail an ongoing Chinese presence and an investment that needs protecting. 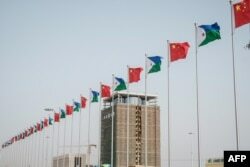 FILE - National flags of China and Djibouti are seen in front of Djibouti International Free-Trade Zone before the inauguration ceremony in Djibouti, July 5, 2018. “They’ve been much more willing to deploy peacekeepers in places like Sudan, in Darfur, [and in] South Sudan. They’ve been much more willing to take those kinds of risks. But those kinds of risks also come with demands,” Nantulya said. FILE - United Nations Chinese soldiers in the United Nations Mission to South Sudan march as they celebrate International Day of United Nations Peacekeepers, in Juba, May 29, 2017. “China has been captive to what one would call a ‘cult of defense,’” Nantulya said. But China is part of an elite group of countries that has such overseas bases. And at least one stipulation accompanies all its deals: Countries must sever diplomatic ties with Taiwan, a country that China considers its own territory. 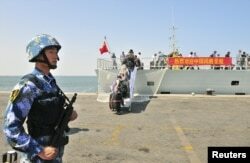 FILE - A navy soldier in the People’s Liberation Army stands guard as Chinese citizens board the naval ship ‘Linyi’ at a port in Aden.